The Benanee catchment is located in south-west NSW bordering the Murray and Murrumbidgee river basins. It has a catchment area of 21,390 square kilometres. Euston, Buronga, Gol Gol and Dareton. The Benanee River basin is made up of a number of ill-defined creeks, streams and ephemeral lakes that contribute negligible inflows to the Murray River, which flows across the basin's south. View real-time data from the Benanee catchment on this website. The largest water storages are the Euston and Mildura weirs. Irrigation, local councils, stock, some forestry. Water users along the basin's unregulated creeks and streams don't always have access to a reliable water supply due to the highly variable nature of flows in the basin and unreliable rainfall patterns. The manipulation of a number of state-owned weirs is crucial to the over-all water management strategy of the Murray-Darling Basin Authority. 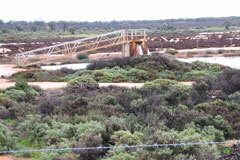 Environmental watering projects such as The Living Murray Project include many sites in this basin.